He wrote about the pressure for new moms and the expectation that comes with breastfeeding. Postpartum depression is a real, and often neglected, condition that many dismiss as baby blues. According to the U.S Centers for Disease Control and Prevention (CDC), one out of eight women suffer PPD. Symptoms include anger, withdrawal, lack of connection to the baby, worrying about harming the baby, and feelings of failure and guilt for not being a good mother, to name a few. If not diagnosed and addressed early, the cost can be devastating. 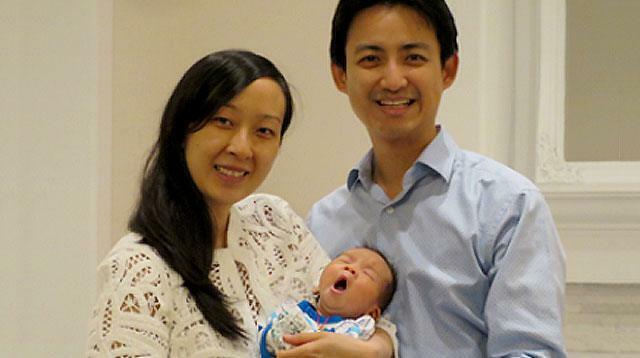 It's what Kim Chen hopes to avoid for future mothers out there when he wrote about his wife, Florence Leung. In October 2016, Florence, who had just given birth to her son in September, left him alone in their car without any explanation. The car was later discovered at a park nearby, but she was nowhere to be found. After a month-long search, her body was found in the waters of Bowen Island, off the coast of Vancouver, Canada, about 40-plus kilometers from their hometown in New Westminster, British Columbia. A little over two months after losing his wife, Kim posted a heartfelt message on a Facebook page dedicated to Florence. In finding the words to say, Kim shared an article about another family who lost their mother to postpartum depression. Kim said the young mom, Allison Goldstein, had a personality that "so similar to Flo in many ways." "It felt like half a year had passed since that day, but in fact it had only been two months. I have been living in survival mode: living a day at a time, sometimes an hour at a time—exactly like many people taught me to do," Kim wrote. "Living at the moment is truly the only way to go through this at this stage," he added. In his post, Kim implied that that the pressure to breastfeed may have added to his wife's feelings of guilt and depression. Although he did not specifically mention if Florence had difficulty breastfeeding, he recalled that the hospital where Florence gave birth, BC Women’s Hospital, gave out a handout that recommended exclusive breastfeeding for the first six months. Kim wrote, "For all the new moms experiencing low mood or anxiety, please seek help and talk about your feelings. You are not alone. You are not a bad mother. Do not EVER feel bad or guilty about not being able to 'exclusively breastfeed,' even though you may feel the pressure to do so based on posters in maternity wards, brochures in prenatal classes, and teachings at breastfeeding classes." Having a baby is a wonderful blessing. But bringing a human being into this world is a huge responsibility that entails a lot of hard work and sacrifice. Motherhood can put on a lot of pressure. Don't be afraid to reach out if you are feeling anxious, helpless, or despondent. Don't let anyone guilt-trip you into thinking you're a bad mom because every mother's situation is different. But if there is one thing that should be the same for all moms, it is this: Your physical and mental well-being should always be a priority. A healthy you can better care for your baby and your family.